When the national library of France was built, it was an impressive feat of engineering and architecture. Like many buildings of the late 20th century, it used quite a bit of glass. In fact, as you can see, the majority of the facade is glass. Unfortunately, that made it into a huge hot greenhouse that started to damage the books. The thousands of giant wooden shutters that were put in to deflect the sunlight are a clumsy solution to a problem that could have been prevented. Who wants to clean those windows? Design is something that everyone feels comfortable having an opinion about. 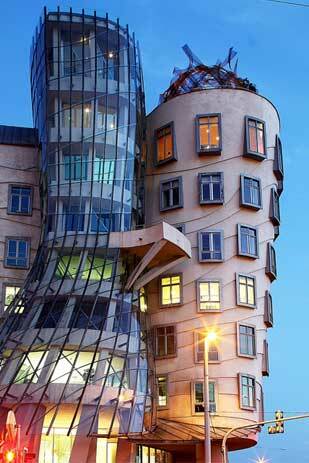 No one is going to look at Gehry’s Dancing House and comment on how elegant the plumbing system is. Design is the emotional element that makes the biggest impression and can oftentimes be the factor that persuades a purchaser into making a bigger spend (both on the web and in construction). When used with purpose and planning, it not only makes things usable but also creates enjoyment and delight. It can be very tempting to make a web project look impressive to passersby without giving due consideration to how people will be using it in their daily lives. Once a company “moves in” to a web site, the form will have to be adjusted to fit the function — just like the library’s big wooden shutters. The more planning that can be done beforehand, the less cost and time these adjustments will take. So, how do you know if your project is at risk of over-design? The tight deadline on the library project meant that many concerns went unheeded. When you are pressed up against a deadline and there is already a design in place, it seems like moving backward to reevaluate what’s already been put together. Don’t let the powers of groupthink and pressures of the deadline weigh too heavily on you. Otherwise, your team may end up pushing through an over-design that will add time and cost in fixes after the launch. Can your windows be washed? The Biblioteque Nationale librarians had little to no voice in the design process. In Dancing House, the tower of windows is so difficult to keep clean that mountaineers had to be hired to wash them. In your current web project, have you talked to the people who will be running or maintaining the site? What content will they need to be able to update frequently? A common over-design problem is to create elaborate interfaces that look great but are inconvenient to update. If there will be any text on the site that needs a developer’s intervention to update, find out how often that information will need to be updated (and the less, the better!). Do you know the function of your form? Originally, the whole French library was going to accommodate the public. After its opening, it was partitioned into a section for scholars and another for the public. On top of that division, the two-building design forced administration and collections to be split by subject areas. These divisions could have been executed in a more successful way from the beginning if there had been enough research up front. Look for examples elsewhere online of the type of functionality you want to implement on your site. If you are working on a redesign, then you have the advantage of talking to people who use the current site. Watch them use it, make observations, and ask questions. Even if there’s no existing site to work from, you can still find members of your target audience to talk to. You might even be able to watch them use sites similar to yours. The more you can find out about who will be using your site and what they’ll be doing while they’re there, the more you’ll be able to design a site that is appropriate for the function they need.